Due to their important social role, ambulatory healthcare facilities must meet the healthcare construction standards laid out in National Fire Protection Association (NFPA) 101, also known as the Life Safety Code. Every three years, NFPA publishes a revised code. The 2015 version of NFPA 101 is the most recently adopted code and replaced the one adopted in 2012. A new code will replace the 2015 version next year. The 2012 iteration of the Code required that ambulatory healthcare facilities total 100 square feet per person. The 2015 edition upped that to 150 square feet per person. That revision brings the Code in line with specifications found in the 2014 Facility Guidelines Institute code. It effectively lowers the amount of people allowed in a facility or suite but allows for greater flexibility in the design of these spaces. The 2015 Life Safety Code no longer requires separation of office spaces and a central atrium via glass partition. This opens up the possibility for tenants to lease shared atrium space and expand or enhance waiting areas. Previously, atria and other entry sequences were reserved only for public passage. From an interior design standpoint, this update allows for more open designs that can improve user experience. From a business standpoint, it frees up more rentable area for the building owner. With regard to safety, this change allows facilities to consolidate exit routes during an emergency. This portion of the Code puts significantly limits tenants’ ability to modify or customize the space they rent. The Code states that applied combustible decorations may take up no more than 30 percent of the area of any wall, ceiling or door if the space is protected by fire sprinklers. In spaces without sprinklers, only 20 percent coverage is permitted. While approved non-combustible materials are not subject to restriction, they’re harder to find and are more expensive. 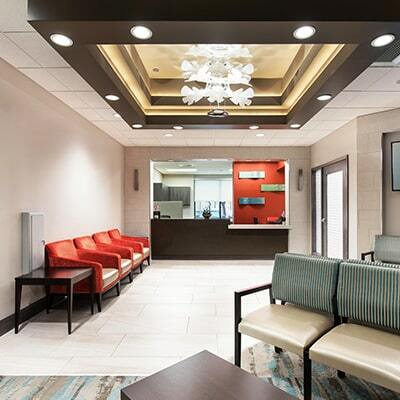 This poses significant challenges to designers and tenants, many of whom readily accept that aesthetically-pleasing healthcare environments have a positive impact on patient outcomes. Among the most difficult aspects of healthcare facility construction is the haphazard way municipalities, states and federal healthcare programs adopt NFPA Life Safety Code editions. These entities do not uniformly adopt the latest version of the Code right away. Some authorities having jurisdiction (known as AHJs) wait many years —and skip over many versions of the Life Safety Code— before finally adopting an updated version. What’s more, some municipalities will tack on their own local amendments that further restrict healthcare facility construction. This means facility owners with locations in multiple jurisdictions need to remain especially vigilant and ensure the designs they develop with contractors comply with the most stringent local codes. There is much at stake: Federal and state healthcare programs like Medicare and Medicaid may not recognize facilities that aren’t compliant with the Life Safety Code; additionally, local authorities could close facilities that don’t comply. At The Korte Company, we’ve waded through these waters for decades, completing dozens of healthcare facility projects across the U.S. since our founding in 1958. We’ve built over $10.5 billion in healthcare value over the years even as building codes and safety norms have evolved. That’s enough work to know how important it is to ensure safety in these facilities. To get the total picture of how we approach healthcare construction from design to groundbreaking to completion, download the guide below.